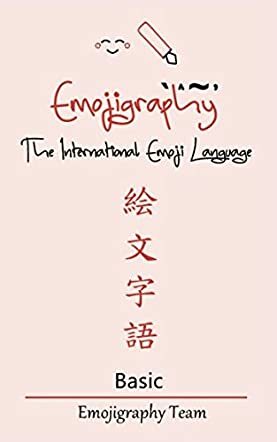 Emojigraphy: The International Emoji Language Basic by the Emojigraphy Team teaches the basics of a new universal picture-based language. Emoji characters have, up until now, been used to convey emotions by adding the characters to the beginning or end of sentences. For example, various facial expressions such as a yellow smiley face or a red heart. However, this book introduces an intuitive grammar for emoji where whole sentences can be created and a more detailed message conveyed. The idea is that people read and write using Emojigraphy and then speak in their native tongue such as English or Chinese. It can also be used by people of all ages. The language of Emojigraphy is still being developed, but those who understand English and other similar languages should be able to learn and understand it easily. The front cover of the Emojigraphy book is beautiful and belies a very well thought through concept. Emojigraphy is fascinating and takes the idea of emoji images or icons to a new and exciting level. Once I grasped the basic principles, reading the message that the images conveyed became relatively easy. I was surprised to find that it really was intuitive. I could see how simply Emojigraphy would be able to break down the barriers of language throughout the world and become an international language. Having seen the way emojis are greatly increasing in number and form, I can see Emojigraphy becoming successful very quickly. This book provides a basic introduction to an interesting new language which will appeal to people. Emoji grammar will make Emoji language becomes more practical and usable. Since it's also intuitive, kids can learn this Emojigraphy language as they are also like Emoji.